Turtle Pass lies on the north shore of Lieutenant Island on Outer Cape Cod. 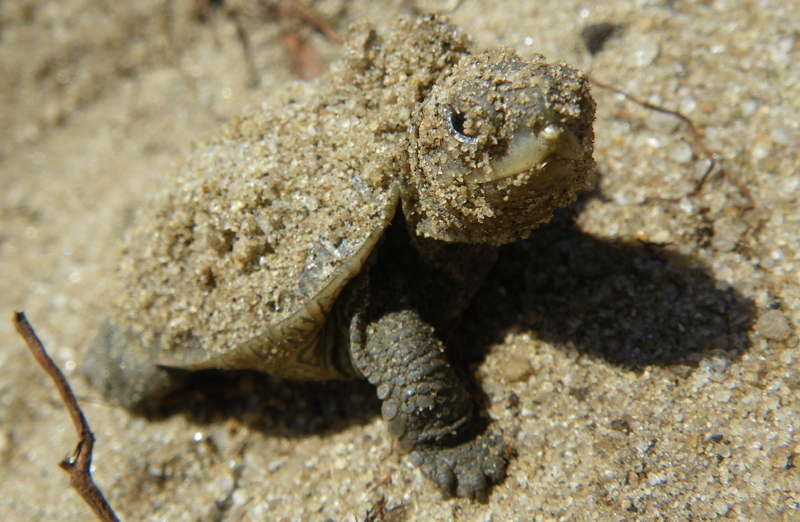 Diamondback terrapin females ride high tides in Blackfish Creek to Turtle Pass, struggle up the steep banks and dunes, and deposit nests in June and July each year. Nest 148 was laid on July 8th atop Turtle Pass and protected under a predator excluder by Sue Wieber Nourse. After 82 days of incubation, yesterday seemed an appropriate time to check the eggs. 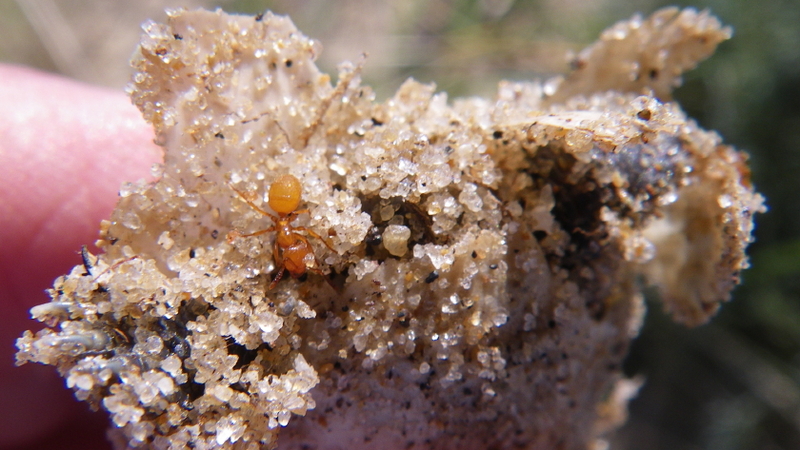 Excavating the nest, I ran into a colony of red ants burrowing through the egg chamber. I found recently pipped eggs with defenseless hatchlings struggling to emerge and nine plump and viable eggs. 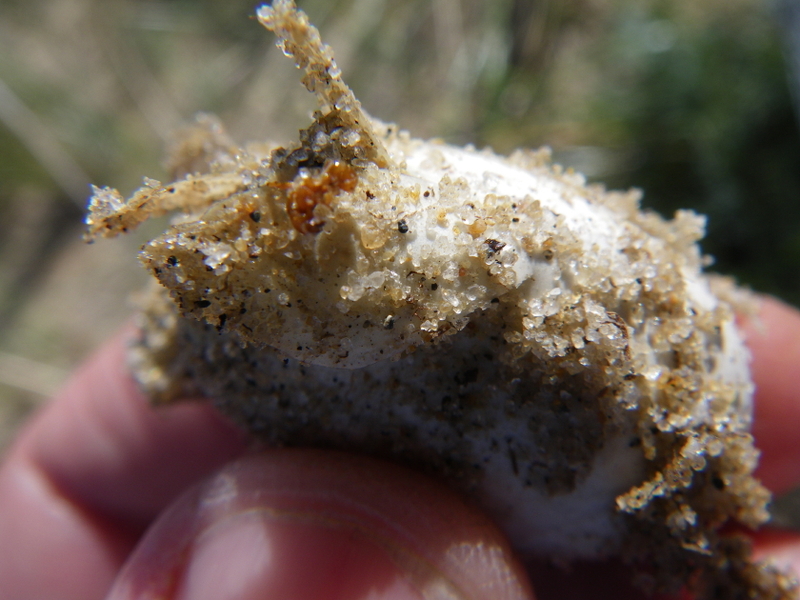 Red ants had entered the pipped shells and were embedded in the egg white and the yolk sacs. Some ants appeared to be stinging the forelimbs of the baby hatchlings. I immediately harvested the nest and cleaned red ants from the pipped hatchlings. 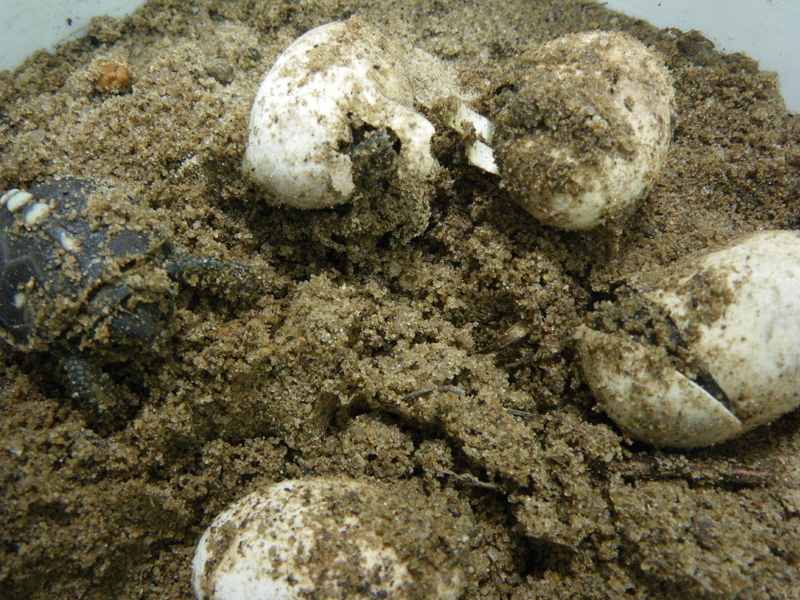 Eggs and hatchlings were placed in fresh, moist sand to complete the incubation process. They will be released into the wild in a week or so. September 25th brought chilling northeast winds off the North Atlantic and blowing across the sand banks of Turtle Point on Lieutenant Island in Wellfleet on Outer Cape Cod. Yesterday’s warm sunshine had induced a large number of hatchlings to emerge from nests throughout Lieutenant Island’s coastline. Today, fall-like conditions saw only two nests hatch. The first, a protected nest on the Hook, yielded three fully emerged hatchlings and 11 pipped eggs with live, viable hatchlings working their way out. The second nest, one which we call a “wild nest” because it was not discovered during the nesting season and was not protected with a predator excluder cage, produced 13 perfect hatchlings. 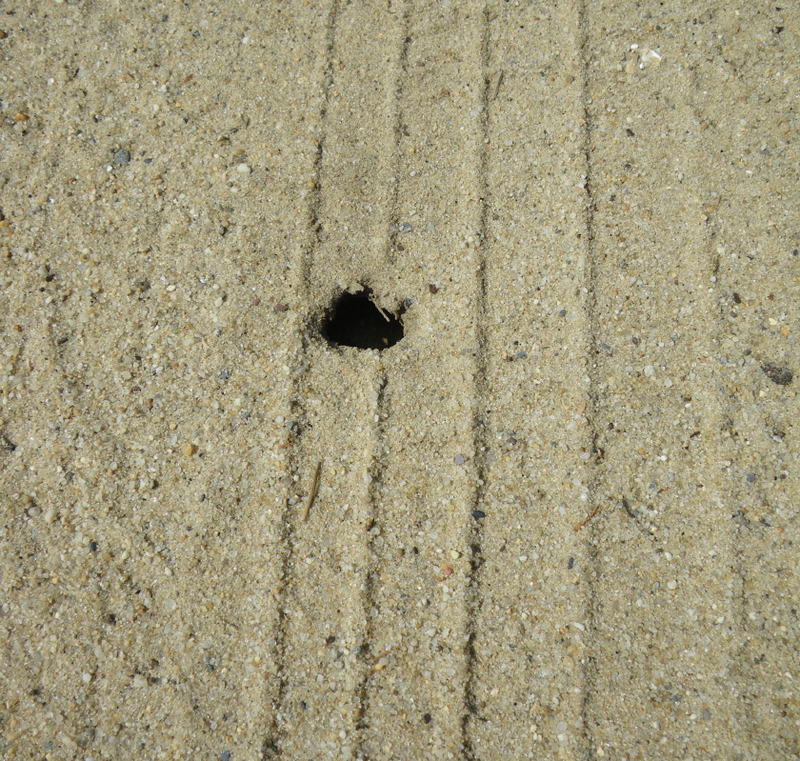 I spotted a hatchling track slaloming from a slope on Turtle Point into the safety of the salt marsh. I dug where the track originated and somehow found my hand underneath the egg chamber of a wild nest. 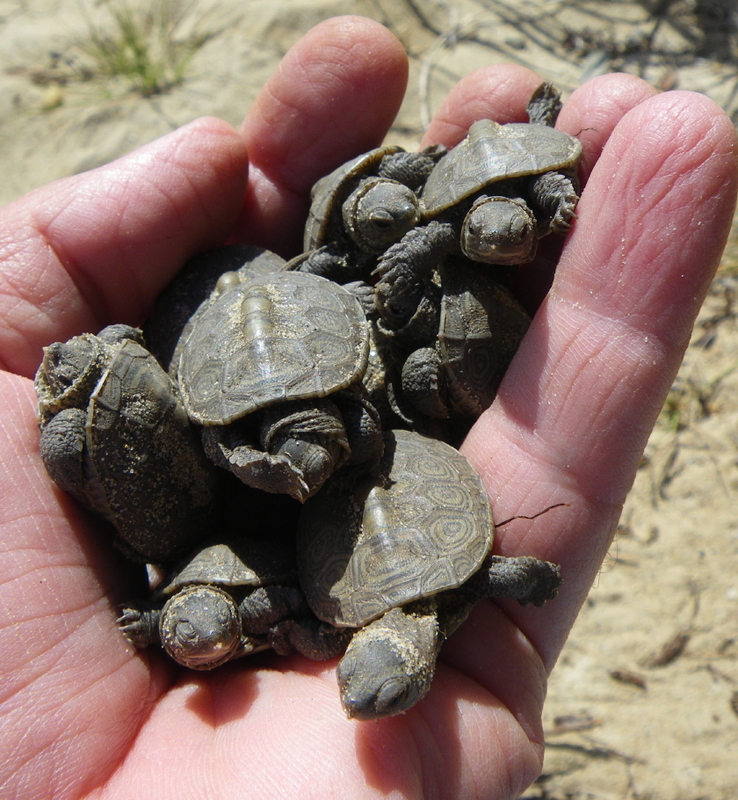 One at a time, 12 perfect hatchlings dropped from the egg chamber into my hand. The family portrait is above. After counting and examining the terrapin babies, and ascertaining that they were ready for release, I placed them back atop their nest. 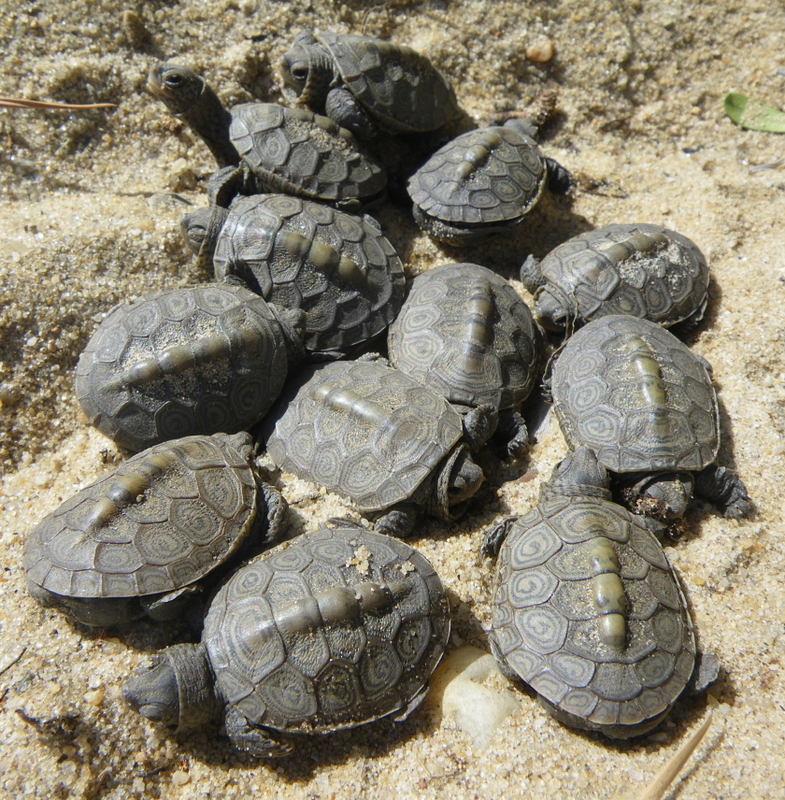 A few seconds of exposure to warming sunshine instill these hatchlings with enough energy and inspiration to make a frantic dash for safety in the nearest groundcover. Well, turtle-frantic, anyhow. They’re still a bit awkward considering this represents their very first view of the world above the sand, and it’s the first exercise in which they’ve ever engaged. So, yes; they are a bit comical. 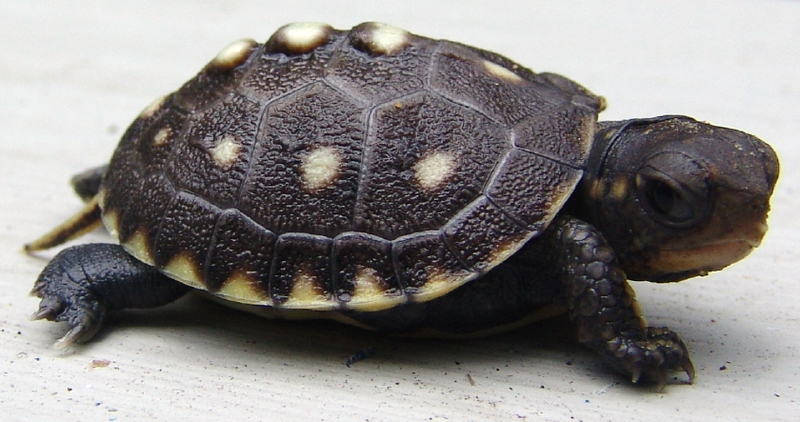 But this dash for cover is a deadly serious activity that is ingrained into the DNA and instinctive rules of every diamondback terrapin hatchling. In this case, the closest vegetative cover lay upland: a dense blanket of hog cranberry (bearberry). Unlike sea turtle hatchlings that head for the brightest horizon, which thankfully is the sea or regrettably might be the nearest 24-hour fast food restaurant, terrapin hatchlings employ a drunkard’s walk strategy. They scramble in random directions, some toward the wrack line and salt marsh, others upland into grass and vegetation, and still others merely burrow back into the dune or sandy bank. A female Eastern box turtle (Terrapene carolina carolina) laid a very, very large nest in Wareham on the SouthCoast of Massachusetts this last June. How large? The nest contained nine plump and healthy eggs, enhanced by frequent and heavy summer rains. This morning these eggs began to pip and two hatchlings emerged by noon. The remainder of the nine eggs have pipped with various body parts pertruding from the weakened shells as they, too, struggle to greet the world. 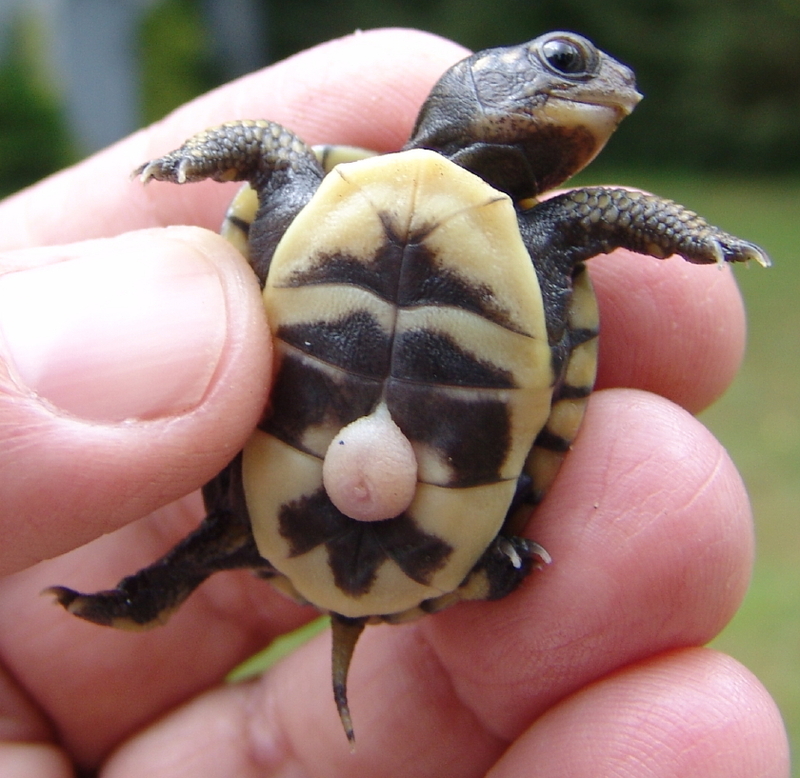 Quite a bit larger than their terrapin cousins, these babies still have a fairly large yolk sac. They’ll be released back at their natal nest site as soon as they have all emerged and their yolk sacs have been sufficiently absorbed. And here are a few more snapshots of our new babies. 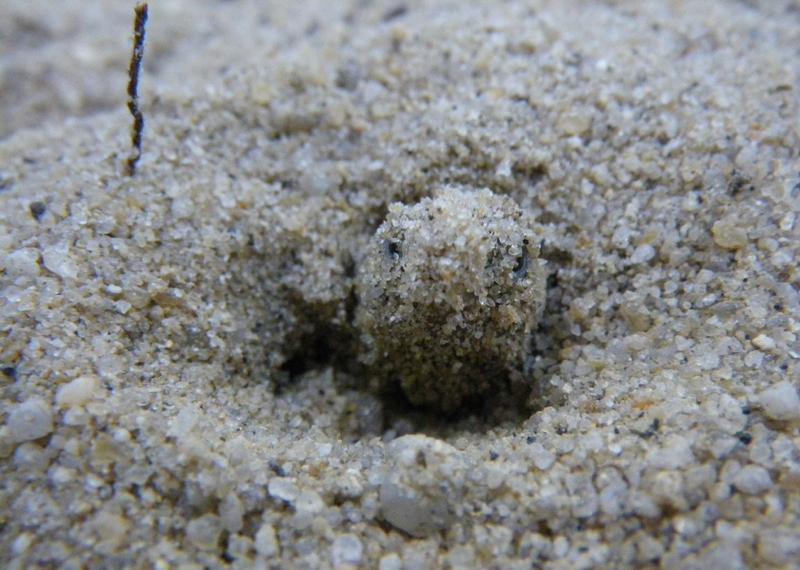 As sun beats down on sand dunes and dirt roadways of Lieutenant Island on Outer Cape Cod, diamondback terrapin nests that have been incubating since late June and early July have begun to yield spunky little hatchlings. 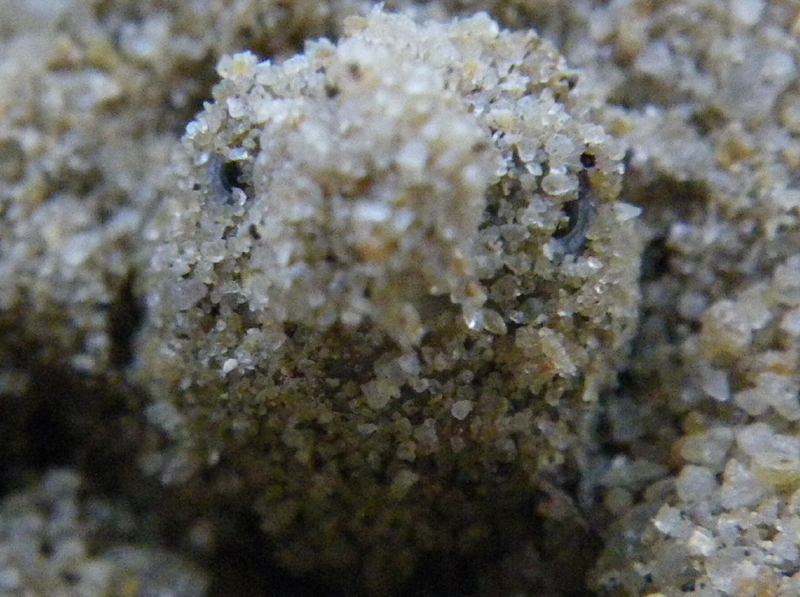 No larger than a tiny pebble, hatchlings are barely recognizable as they pierce the surface and stare into the sunlight for the very first time. 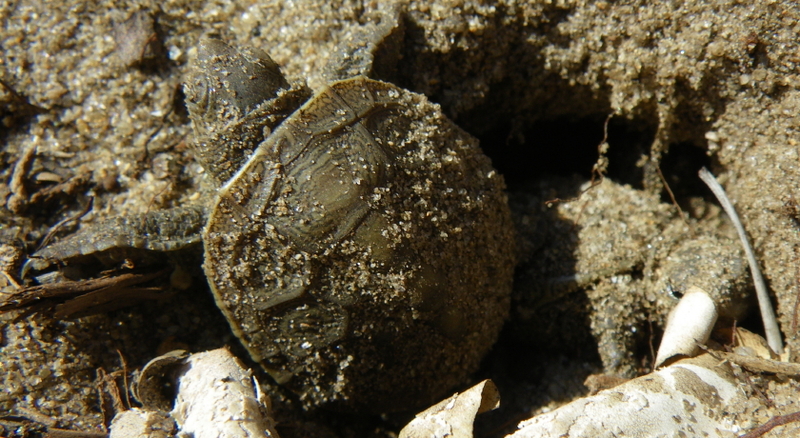 The opportunity to watch these miniature turtles rise from beneath the sand where they have been incubating in eggs for the eighty days seems truly miraculous. A second nest is caught by the Turtle Journal team just as hatchlings break the surface and struggle down the sandy slopes into the safety of the salt marsh. 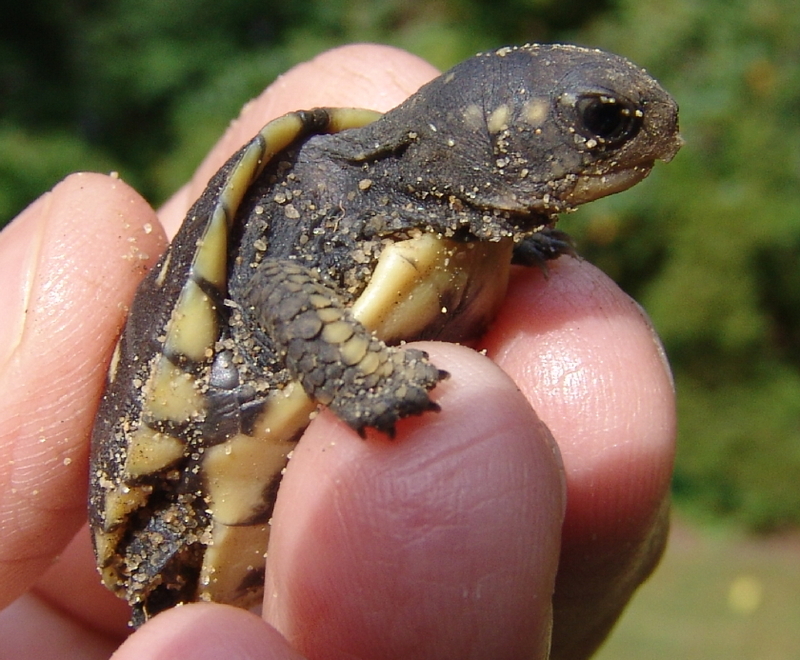 Another miracle is how female terrapins survive nest laying in the middle of Outer Cape dirt roads, and how the nests remain architecturally sounds under summer tourist traffic, and how quarter ounce hatchlings can carve their way to the surface through a quarter foot of compacted soil nearly as hard as concrete, and how they evade predators and automobiles as they scramble to freedom and safety in the salt marsh. 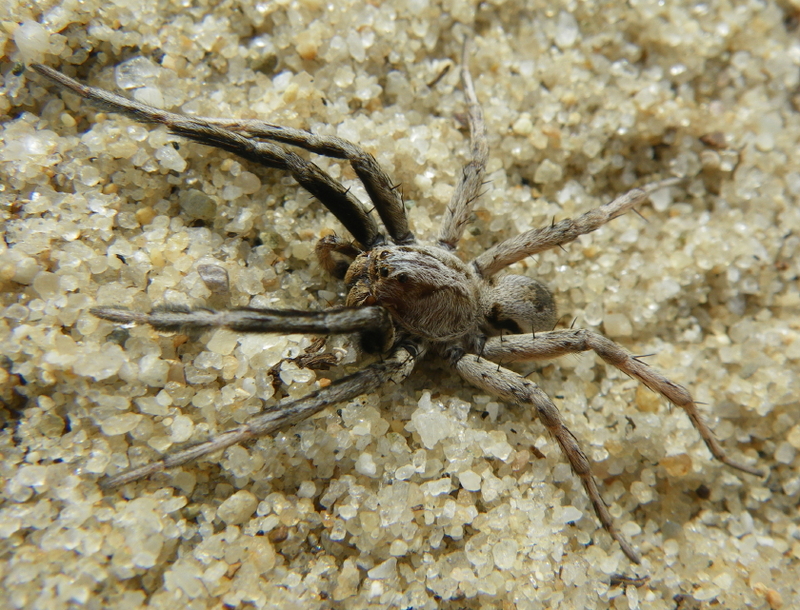 Checking terrapin nests on the sandy hook of Lieutenant Island this week, I stumbled across an interesting spider vignette. A wolf spider stood at the opening to a perfectly circular wolf spider hole and appeared to be casting a mesmerizing spell on what might lie beneath. When the spider tried to enter the hole, something happened to cause it to scurry several inches away. 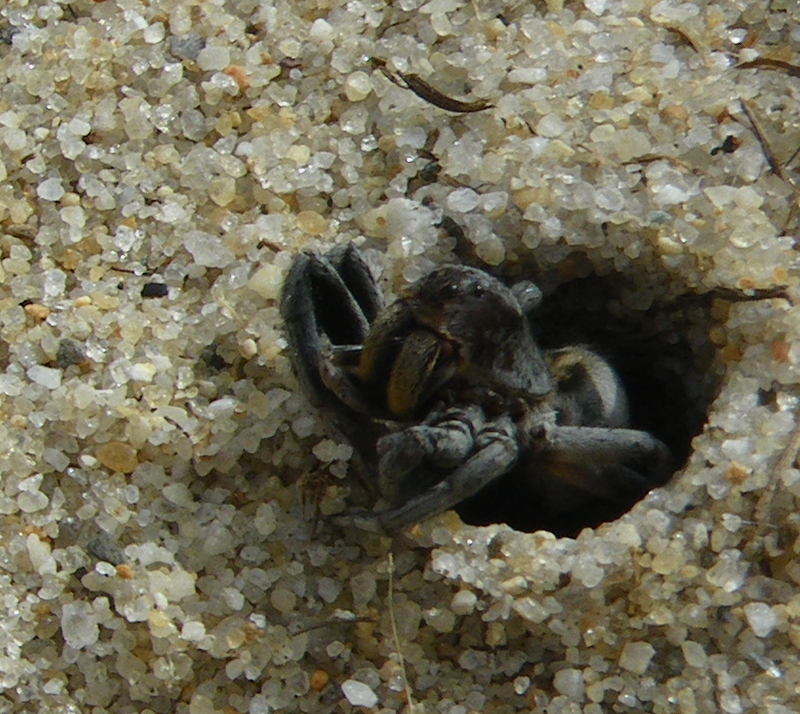 Then, a second wolf spider crept out of the hole to investigate what was happening topside. 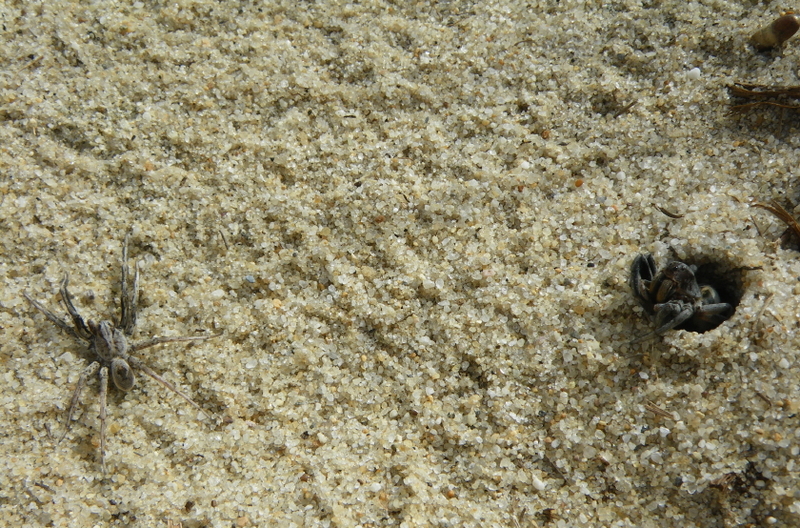 The two spiders stood a few inches apart for what seemed like an eternity … or at least long enough to out-wait me, as I had to proceed with my survey of terrapin nests out on this isolated dune arm of Lieutenant Island. 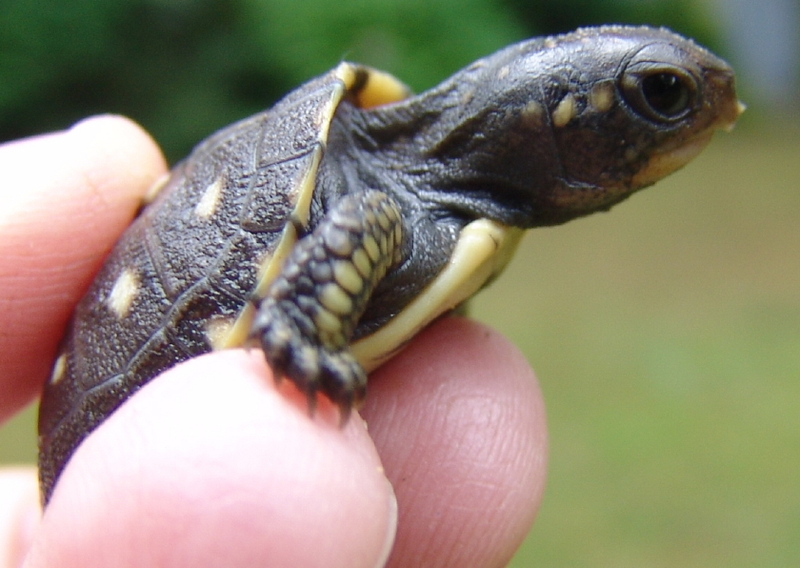 You are currently browsing the Turtle Journal blog archives for September, 2009.